In NJ, while growing up, my mother did our laundry at the laundromat. I couldn’t wait to have a washer and dryer. When I was older and I had money, I bought her a washing machine and she would line dry the clothes. When MJ and I married, we lived in a small apartment for the first two years and we couldn’t have a washing machine. We had to do our laundry at the laundromat. Again I couldn’t wait to have a washer and dryer. Then we moved into a house and we had a washer and dryer. YAY! 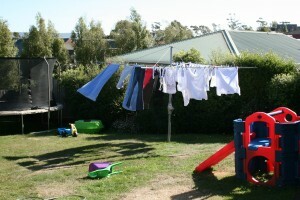 My in-laws visited shortly after and they installed a clothesline in the backyard for us. We used it but usually for things that we didn’t want to put through the dryer. The laundry room was in the basement and I couldn’t imagine bringing up a basket of wet clothes up to the first level to hang when I was already tired from work and being a first time mother. We saved the clothesline for special occasions. At least, that’s what I told others. Since we’ve been in Australia, we’ve realized that more people line dry their clothes than not. They even have these fancy pole clothesline and they come in all sorts of shapes and sizes. I don’t know if it’s just an old-fashioned custom that has stayed around or if it’s due to saving energy and therefore the environment. Who knows? But it does have its merits. What made me write about this today? Well it’s a lovely warm and breezy day to hang some clothes outside and I just thought I would share. Go do something for the planet and hang dry your clothes today! Share the post "Line drying"